The grandeur and magic of Disney World has surpassed every expectation and set the standard for theme parks and attractions world wide. The Orlando area is home to the 30,500-acre Walt Disney World Resort complex with four major parks, two water attractions, twenty resort hotels and an additional half dozen entertainment venues and recreation destinations! The original Florida Disney attraction, opened in 1971. Cinderella's Castle sits at the center of seven fantasy and adventure lands. Frontierland - Old-time, wild west theme. 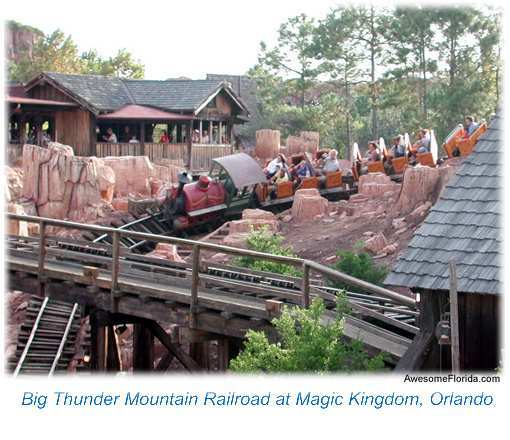 Country Bear Jamboree, Splash Mountain® and Big Thunder Mountain Railroad. FantasyLand® - Enchantment and fantasy theme. Cinderella's Castle, Cinderellabration, "it's a small world", Peter Pan's Flight, Mickey's PhilHarMagic. Mickey's Toontown Fair - Disney characters. Mickey's Country House, Minnie's Country House, The Barnstormer at Goofy's Wiseacre Farm. Tomorrowland - Futuristic. Space Mountain®, Buzz Lightyear's Space Ranger Spin. Liberty Square - Post Colonial-America. Liberty Square Riverboat, The Haunted Mansion. AdvertureLand® - Fantasy-adventure. Jungle Cruise, Pirates of the Caribbean. Main Street, U.S.A.® - Victorian-America. SpectroMagic Parade, the Railroad, Wishes™ Nighttime Spectacular. Experimental Prototype Community of Tomorrow. The park is organized into two distinct areas - Future World, and World Showcase. Future World - Technology theme. Spaceship Earth, Mission: SPACE, Test Track, Universe of Energy, Honey I Shrunk the Audience, Journey Into Imagination With Figment, Turtle Talk with Crush. World Showcase - Cultural and architectural replicas from 11 countries. IllumiNations: Reflections of Earth, Canada, United Kingdom, France, Morocco, Japan, American Adventure, Italy, Germany, China, Norway and Mexico. Film and TV production theme with "back lot" tours, stage productions, shows and rides based on Disney films. Backlot - The makings of Disney's shows and adventures. "Honey, I Shrunk the Kids" Movie Set Adventure, Indiana Jones™ Epic Stunt Spectacular!, Star Tours - the ultimate Star Wars™ thrill ride. Hollywood Boulevard - Golden age of Hollywood theme. The Great Movie Ride. Sunset Boulevard - Hollywood street of the 1940s. Rockin' Roller Coaster, Twilight Zone Tower of Terror, Fantasmic! Animals, live and mythical. The park is organized into seven areas. 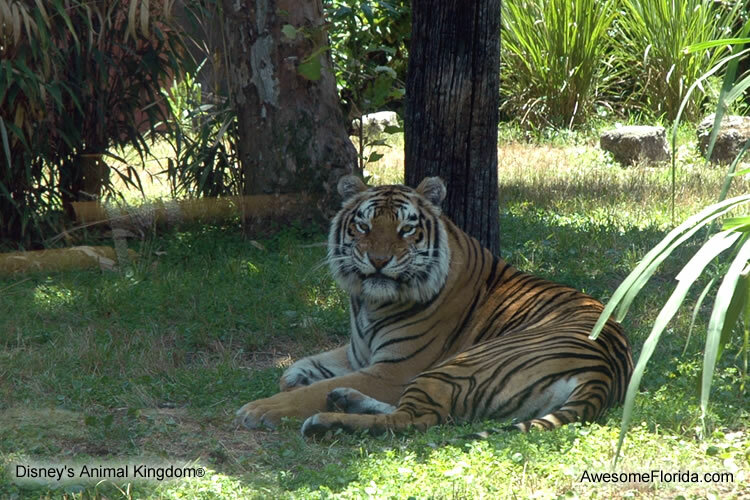 Oasis - Animal viewing locations and tropical gardens. Rainforest Cafe®. Discovery Island® - The Tree of Life is central to this island that leads to all other lands. The Tree of Life, It's Tough to be a Bug!®. Camp Minnie-Mickey - Meet Mickey, Minnie and other characters. Festival of the Lion King. Africa - African savannah were live animals roam free. Kilimanjaro Safaris®, Mickey's Jammin' Jungle Parade. Rafiki's Planet Watch® - Animal protection and conservation. Affection Section, Conservation Station. Asia - Indian ruins and exotic animals. Kali River Rapids®, Expedition Everest - Legend of the Forbidden Mountain™, Maharajah Jungle Trek®. 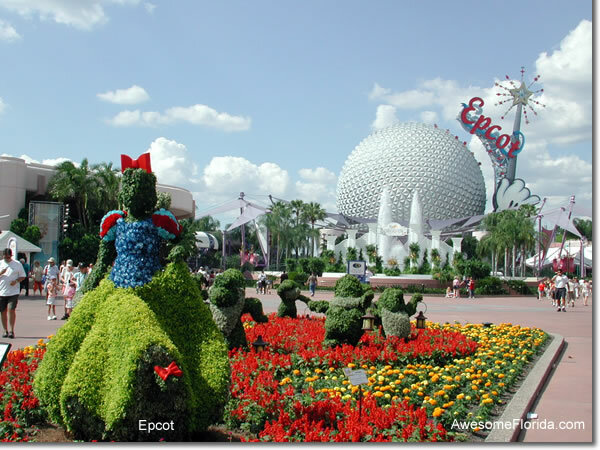 Magic Kingdom and Epcot have a lot to offer. Two days are needed at each of these parks for visitors who wish to realize the full experience available from these amazing theme parks. The parks are least crowded after schools start in August / September and before Thanksgiving. Arrive early just before the park opens, take a break in the middle of the day and return in the late afternoon or early evening. This is particularly helpful during the heat of the Florida summers. Head for the most popular rides first. The lines get longer as the day goes on. Head for the back of the park if arriving when that park opens. The areas furthest from the entrance are less crowded as quests slowly fill the park. Use the FastPass®! Lines at the most popular rides can be very long. FastPasses allow guests to move to the font of the line for a limited number of times during the day. Buy tickets ahead at Disney's web site or other source to avoid waiting in line at the ticket booth upon arrival. Allow sufficient time for mailing if purchased on-line.